Ultra-high-definition screens with tranquil nature videos in your waiting room can significantly reduce your patients’ dental anxiety. Dental anxiety is a common and challenging problem for dentists and staff alike. It’s a condition that we see in many patients here in our offices in Cologne, Germany, but it’s particularly evident in children and older adults. Our practice consists of two offices with 12 dentists and we see around 200 patients per day, so we have a good perspective on the trends in patient care and concerns. From my own experience and in conversations with colleagues, I would estimate the incidence of those who are anxious about seeing a dentist as high as 70% or 80%. Our goal has been to significantly reduce that rate of incidence within the context of our practice, and we’ve been very successful in doing this by experimenting with some new approaches and non-traditional techniques. There are many reasons for this high percentage of patients who experience dental anxiety. But at the core of this challenge is the fact that the mouth is a very sensitive part of the body, and one that a patient can’t see or monitor as you’re working there. So, a patient has to put a lot of trust in the dentist to be working in the mouth. Establishing this level of trust has to do with reducing the fear of the unknown and how the imagination can play into that. Some of a patient’s perceived fear has to do with unknowns such as the possibility of sudden, unexpected pain or how long the treatment will take. These unknowns can make patients feel very anxious, and the longer they have to wait, or the more stressful the environment the waiting takes place in, the higher the chance of incidence of dental anxiety. The most important thing for us as dentists is to gain the trust of the patient as quickly as possible, and you have about four or five minutes after meeting a patient for the first time when you can establish this baseline of trust. There’s an old saying that you never get a second chance to make a good first impression, and this is true with all patients, but particularly with a new patient. It’s then critical to establish a positive first impression because that will be what patients remember, and it will set the tone for your relationship for what will hopefully be a long time. We put a significant amount of effort into supporting the foundational notion of establishing a great first impression. And there are really two key steps to doing so. The first step is establishing the overall atmosphere and environment and that moment when a patient walks in the door and sits down in the waiting room. The second step is managing the moment they first meet you and your staff. It’s important to recognize the impact the first experience, that of entering and sitting in the waiting room, will have on that moment when the patient meets you, the dentist. In addressing the need to make a good first impression with regards to the office environment, we put particular emphasis on three of the five core senses: smell, sound, and sight. One of the first things we started when we looked at the principle of creating a strong first impression was to get rid of our “dentist’s office” smell, that chemical odor associated with sedation and invasive procedures that triggers the feeling of being in a hospital type of environment. We use diffusers with essential oils throughout the office to help mask the smell of the chemicals, and we try to store any chemicals in enclosed areas away from those areas where patients spend time, especially the waiting room or treatment rooms. Sound also has a very powerful impact on triggering a sense of stress or inducing a feeling of relaxation. Of course, everyone is familiar with the anxiety-producing high-pitched sound of a drill, so we use the latest tools with a low incidence of associated noise that can trigger these fears. We also found that a “chill” style of music with a light pulsing beat piped in throughout the office helps mask the sounds of dentistry such as drills, while creating a distraction as patients focus on the music and feeling associated with that style. Particularly in the waiting room, it helps for patients to be distracted by music. The waiting room is one area that is often neglected when it comes to addressing dental anxiety and the negative associations with visiting the dentist. Research shows that the average waiting time in a dental office is 20 to 30 minutes. While we do our best to minimize this wait, the unexpected can happen and treatments can take longer than expected. This means that waiting and treatment windows creep beyond scheduled times, especially as the day goes on. Our goal is to create a positive feeling as soon as a patient enters the waiting room. Along with the low-volume chill music and essential oils fragrance, we incorporate soft and relaxing colors and plants and have a very open entrance, which helps visually convey the feeling of calmness. Technology plays a role in reducing anxiety via sight as well. The most successful thing we’ve done to address dental anxiety, and this is based on patient comments and feedback, has been installing large screen ultra-high-definition displays in the waiting room of our ZFZ Dental Clinic in Cologne, where we are known for our attention to treating patients who suffer from dental anxiety. The displays we use are part of a turnkey service provided by a company called atmosphere-Healthcare. The company shoots high-definition scenic nature video content from around the world. It’s produced in a sort of slow motion style, which really conveys a sense of relaxation and calmness. Unlike many dental offices, we don’t use waiting room displays to play movies or commercials that upsell services. We have found that such uses of displays actually contribute to the feeling and high incidence of dental anxiety. 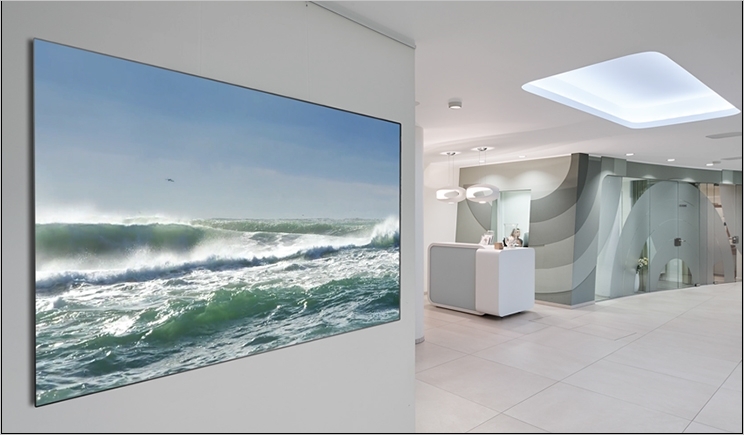 This type of nature-centric visual display service has become very popular in medical and dental offices in Europe, and it is now starting to take off in the United States. We like it because it’s turnkey and doesn’t require time or effort from the staff to manage the playback and setup. The content comes installed on a digital media player, and it’s ready to be played back on the provided ultra-high-definition displays, which make the nature scenes extremely lifelike, almost dreamlike. This sense of calmness that comes with exposure to nature visuals in a medical or dental environment is actually the foundation of a well-documented and highly respected design field called biophilia, which is the integration of nature in design to induce the feeling of calmness and relaxation. Prior to installing the atmosphere-Healthcare systems in our offices, I read some research on this subject from a noted professor in the field of biophilia, Dr. Roger Ulrich. I was intrigued by his studies of using nature scenes in healthcare environments to enhance the sense of calmness and relaxation among patients. Research by Dr. Ulrich and others including Dr. Erich Fromm found that nature scenes and sounds have a measurable effect on reducing a patient’s anxiety level, while shortening the perceived time in waiting rooms considerably. The research also indicated that viewing nature scenes in particular (as opposed to other types of content such as movies) helps establish a baseline for improved communications between medical staff and patients and may even reduce post-operative recovery times. One really positive benefit for us is that this more relaxed state reduces the need for sedatives in certain patients. I can’t overemphasize the impact the high-definition nature visuals has had on levels of reduced patient stress and higher numbers of referrals. We tried the system out first to test the theory that patients who are exposed to nature scenes and sounds will come into the treatment room in a more relaxed state. For those who suffer from dental anxiety, this is a very desirable value proposition for us. Our anecdotal impression is that the use of nature as a calming factor in addressing dental anxiety is very valid. After just a short while of using the scenic nature content, we saw that the patients really liked it. They talked about it. They told their friends about it, and that’s also very good for our office in terms of promotion and word of mouth. Today, we have a consistent stream of new patients every week, and we’ve learned that many are coming because their friends recommended us because of the atmospheric foundations we’ve focused on: the smells, sounds, and sights. Our ultimate goal is to establish a level of trust and impressionability with a patient that encourages a positive feeling of the experience that is marked by a pattern of recurring checkups while reinforcing the importance of good oral care practice. Evidence of our success with regards to this is a regular stream of new referral patients who come to the clinic based on the positive experiences of their friends and colleagues. While we are not measuring the specifics of why those referrals are happening yet (we will soon), I can say with confidence that the attention we put into creating a calming atmosphere incorporating relaxing sights, sounds, and smells is having a significant impact on our high levels of satisfaction and up-trending growth in referrals and revenues. Dr. Alamouti is the principal of a high-end dental practice in Cologne, Germany, as well as a partner in a full-service dental clinic in Cologne. He is a specialist in endodontic dentistry with areas of expertise including implantology (certified by the DG), aesthetics (DGAZ), and functions diagnostics and therapy (DGFDT). Listen to a podcast interview with Dr. Alamouti on addressing dental anxiety in the office environment.